Taman Negara is Malaysia's prime national park and the leading ecotourism destination on the Malay Peninsula. Tour companies offer a variety of packages including transportation from Kuala Lumpur. 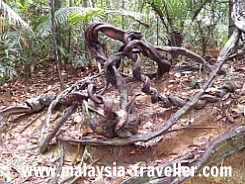 They can often be expensive but you don't have to pay for a costly guided tour to explore Taman Negara. I recently did an independent trip and it was good value. The details are below but first some background information. It's Old. Said to be more than 130 million years old, the park is more ancient than the Amazon or Congo basin rainforests. It's Big. Taman Negara covers an area of over a million acres spanning 3 states - Pahang, Kelantan and Terengganu. For comparison it is about the size of the UK's Lake District and Snowdonia National Parks added together. It's Diverse. 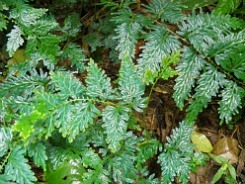 It is claimed that there are more tree species in a single hectare of this forest than there are in the whole of North America. There are reckoned to be more than 15,000 plant species, 150,000 insect species, 25,000 invertebrates, 675 bird species, 270 reptile species, 250 freshwater fish species and 200 mammal species living within the park boundaries. That it is a restricted area requiring advance bookings from the Department of Wildlife and National Parks in Kuala Lumpur. This is not correct. 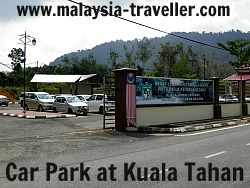 You do need a permit to enter the park but you can obtain this on arrival at the Park HQ at Kuala Tahan. That the park is in a remote and inaccessible location. Again not true. 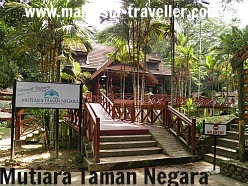 You can arrive at Taman Negara within three hours of leaving Kuala Lumpur. Access Points to Taman Negara. 1. The most popular entry point is at Kuala Tahan in Pahang. 2. Sungai Relau near Merapoh (also in Pahang) is closer to Gunung Tahan, Peninsular Malaysia's tallest mountain. 3. The park entrance at Kuala Koh in Kelantan was opened in 1995. 4. Tanjung Mentong is located on the southern shores of Lake Kenyir in Terengganu and is an alternative access point to the park. 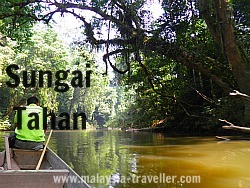 The rest of this page concentrates on the Kuala Tahan entry point. Most tours will involve a bus and river journey to reach Taman Negara but I drove all the way to Kuala Tahan from Kuala Lumpur in my own car. The distance from the toll booth at the start of the Karak Highway (E8) on the northeast fringe of Kuala Lumpur to Kuala Tahan is 218km and the journey took 3 hours driving within the speed limits. Exit the Karak Highway at the Temerloh turn-off and take route 98 towards Jerantut. Just before Jerantut you reach a T-junction and turn right on route 64. After a few kilometres turn left. Taman Negara is signposted at both of these turnings. It is not necessary to have a four wheel drive vehicle for this route. 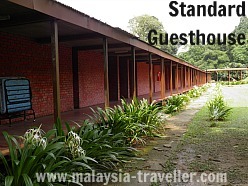 On arrival at Kuala Tahan you will find a large manned and fenced car park where you can leave your vehicle securely for the duration of your stay. Parking here costs RM5 per car and RM 10 for a bus. 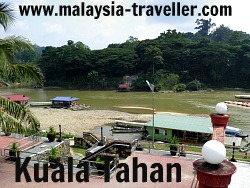 Kuala Tahan is a sleepy village on the opposite river bank to the national park entrance. Besides the car park there are a few mini markets where you can buy soft drinks, water and snacks, a couple of basic restaurants and a number of places offering budget accommodation for travellers. On the river's edge are a few floating restaurants offering a reasonable selection of Malaysian and international dishes at low prices. Here too is where you can catch one of the several small boats who will ferry you across the river (fare RM1 - journey time 1 minute) to the opposite bank where the park entrance is located (and the Mutiara Resort - the only hotel within the park boundary). Here is the Park HQ where you have to pay for a permit to enter the park (RM 1 per person which covers the whole duration of your stay) and a permit for your cameras and videos (RM 5 per piece). As mentioned earlier the park is huge, covering a million acres but the vast majority of visitors barely stray more than a kilometre or two beyond the park entrance. There is nothing wrong with this. After all one bit of rainforest is much like another and even close to the Mutiara Resort it is possible to feel the atmosphere of the national park and perhaps spot some of the park's wildlife like deer and wild boars. About 1.7km walk from the Resort is the Canopy Walkway, which consists of 6 long narrow planks, totalling 530m in length, suspended 40 - 50m above the ground in a cradle of nylon ropes and anchored by steel cables wrapped around sturdy trees at each end. Only four people are allowed on each span at any one time. 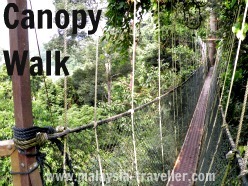 The walkway, the world's longest, sways and wobbles but is safe enough and provides a birds-eye view of life in a jungle canopy. 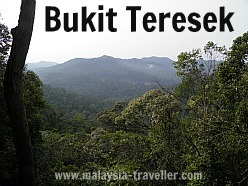 Close to the canopy walkway is the trail to the top of Bukit Teresek, a 334m high hill from where you can enjoy fine views of the national park. There is a boardwalk style path going much of the way up but this was closed for repairs during my visit as segments had been washed away by storm damage. Instead I had to use a rough trail marked by ropes and plastic tape. It took about an hour and a half to go up and down. This excursion is a popular trip by narrow river boat which holds a maximum of 4 passengers and two crew members, one steering the outboard motor in the rear and the other sitting at the bow watching out for rocks and obstacles. From the jetty in front of the Mutiara Resort we rode the boat for around 45 minutes and then walked for 15 minutes along the edge of the beautiful Sungai Tahan until we reached Lata Berkoh, which is an area of rapids where it is possible to swim with caution if river conditions are suitable. Then we walked back to the boat and rode back to the start point. The round trip costs RM 160 per boat, whether you are two people or four. It was the most expensive activity of my stay but well worth it. Tip. Book the trip from the Park HQ to obtain the above price. The Resort hotel charges more. 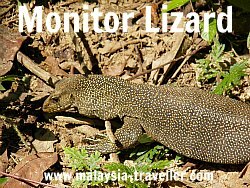 Other popular activities include a guided Night Jungle Walk where you might get to see scorpions and snakes and you will definitely see plenty of insects and creepy crawlies. 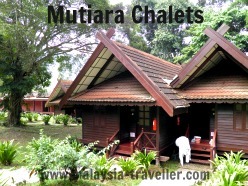 The Mutiara Resort charges RM55 for this trip. 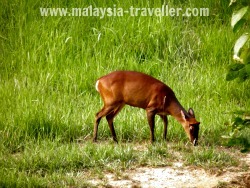 There is a Hide and a couple of boardwalk loops close to the Mutiara from where you might get to see some of the park's wildlife such as this deer near the Tahan Hide. Further afield there are some caves to explore (Gua Telinga 2.6km away, Gua Kepayang Kecil 16.7km, Gua Kepayang Besar 17.7km and Gua Luas 20.9km away). For the super-fit mountain climbing enthusiast, Taman Negara contains Gunung Tahan (2190m), Malaysia's 6th highest peak and the highest in Peninsular Malaysia. 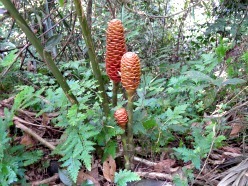 To climb Gunung Tahan requires a trek of between 5 to 9 days depending on the route chosen and experience levels. It is said to be extremely arduous and necessitates frequent river crossings and scaling numerous smaller peaks on the way. Climbers have to carry all their own food and camping gear and clothing suitable for the nighttime cold near the summit, heavy rain and the steaming heat. 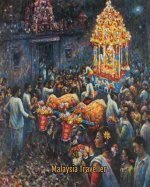 To the Malays it is the abode of all the most malignant spirits, and contains the matrix of all gold and silver ores, which is guarded by gigantic man-eating apes as big as bulls and immense serpents and mosquitoes as big as fowls. This is one activity that should not be attempted without a skilled guide. 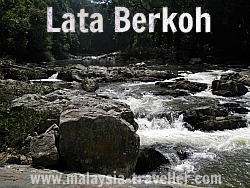 You can find more photos and information about Taman Negara on my blog. I stayed in The Mutiara Taman Negara, the most upmarket resort in the area and the only hotel within the park boundary. 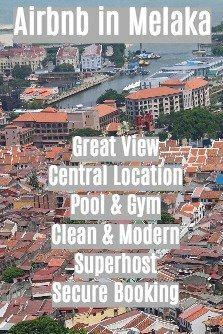 I booked online through Agoda who offered a 50% discounted rate of USD49 (MYR 155) per night including taxes and breakfast for two. This compared to the cheapest rate on the Mutiara's own website which was RM 280 per night. Having said that we were put in one of their most basic rooms (standard terraced guesthouse with hot shower, airconditioning, safe and fridge) in a rather ugly brick built block compared to their more attractive wooden chalet style rooms. The room was far from luxurious with no TV but that is not what we came to the rainforest for. Breakfast was quite good and I thought our stay was good value for money. We did not eat lunch or dinner in the hotel (which were relatively expensive with buffets priced at RM 75 and RM 80 respectively) but instead we ate at the good value floating restaurants on the opposite river bank. 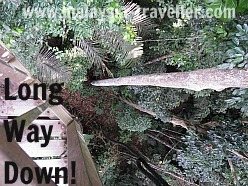 Click here for other Top Pahang Attractions.